Arvind Panagariya, Vice Chairman of Niti Ayog, Government of India, joined us for an off-the-record IDFC Institute Conversation on the State of the Indian Economy. Watch his video interview with IDFC Institute's Dr. Vivek Dehejia below. 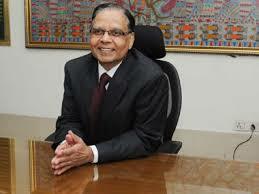 Dr. Arvind Panagariya is Vice Chairman of NITI Aayog, Government of India, with the rank of Cabinet Minister. He is also Professor of Economics and Jagdish Bhagwati Professor of Indian Political Economy at Columbia University and Non-resident Senior Fellow at the Brookings Institution. In the past, he has been Chief Economist of the Asian Development Bank and Professor of Economics and Co-director of the Center for International Economics at University of Maryland, College Park. He has also worked for the World Bank, IMF, WTO and UNCTAD in various capacities. He holds a PhD in Economics from Princeton University.